On this day, anarchist plans to bomb Boston landmarks with Jewish ties were discovered in the most unlikely of ways. Officer Christopher Connolly was behind Leo V. Felton in a Dunkin' Donuts when he passed counterfeit currency. The clerk noticed the fake bills as Felton exited; Connolly made the arrest. Agents went to Felton's North End apartment where they discovered that he and Erica Chase had made plans to bomb the New England Holocaust Memorial. Read more about the New England Holocaust Memorial. England's Prime Minister never expected this tea tax to cause an outcry, let alone revolution. In 1767, England reduced its property taxes at home. To balance the national budget they needed to find a mechanism for the American colonies to pay for the expense of stationing officials in them. The officials would generate their own revenue by collecting taxes on all imported goods, and once paid affixing stamps on them. 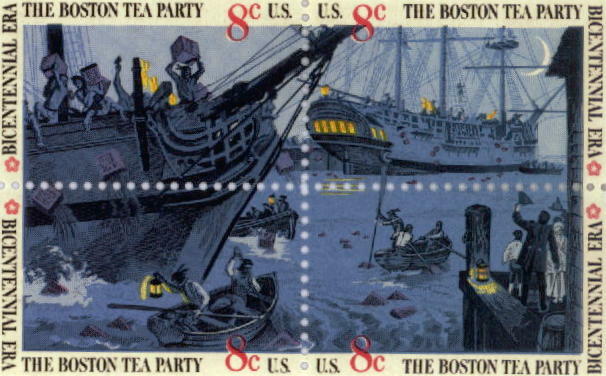 This Stamp Tax generated more in the way of protests and smuggling than added revenue. Religion. Politics. Rebellion. Boston�s pedigree was forged back in England in the midst of religious dissension, where Puritans and Pilgrims sought religious reform, and Cavaliers and Roundheads vied for political power. The question isn't where did Boston get its name � but how. Visiting Boston, but only have a short time? Check out our Itinerary for a Short Visit.